I finished this quilt a couple days ago. Maybe I should start keeping track of when I start new projects... this one took quite a while but I just made a few blocks at a time, and then used several of my blocks in my charity version of this same quilt. My sewing machine had a computer malfunction partway through quilting this. I was still able to quilt, but the computer screen is stuck on bobbin winding mode. I have a Janome MC4900... any other Janome users have this problem? It's been at the shop for a few days and I'm waiting to hear what the damage will be. I free motion quilted a curvy corner-to-corner thing on all the squares, and then did a simple stipple in all the background space. We went to Utah for spring break earlier this month and my mom let me bring home her Juki for a while, so I finished the quilting using that machine. I am liking the Juki, it's so fast! And here's the back. I started with the pink/orange section in the middle, I wasn't thinking of anything I could use that Amy Butler piece for, and then used a few other fabrics I am ready to be done with to make it wide enough. Then the green... the remains of some of my very first quilt shop fabric purchase are in that chunk. I have moved on from the dusty sage green love of the late 90s, for sure. After I finished up the green, I thought I was going to use a black and white Chinese character fabric for the rest of the back but it wasn't meant to be so I put together another section made from blues and then separated the 3 colors with white/white-ish 6.5" strips. The binding is 4 colors--aqua, pink, purple, and yellow. I was going to do it all with the aqua/green Heather Bailey bead fabric but it would have used it almost all the way up so I mixed it up a little bit. Thanks to Blue Elephant Stitches for the Granny Square Quilt tutorial and to traceyjay quilts for the setting triangles directions! gorgeous!! I love the scrappy yet symmetrical feel of the back! What a beautiful quilt this is!! 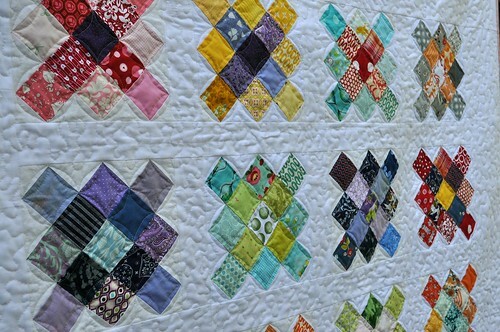 What a beautiful quilt...the granny square design is such fun! Hope you get your sewing machine fixed soon! I can't decide if I like the front or the back best! You have capitalized on such a great idea to make the backs as nice as the fronts! I am inspired again.I started one and did 3 strips on the back with front fabric of which I made chevrons using HST's, looks nice, but this demon in me forced me to do FMQ inside the squares between the chevrons and that is taking literally forever and I get really tired of doing it as it is quite detailed, but one of these days it'll be photo worthy and I'll send pic. Keep up the good work as it inspires me! What a great looking quilt! Love it ! SO pretty and I love the back! I think I might have been distracted by your links at the end there and wandered off and not come back to comment. 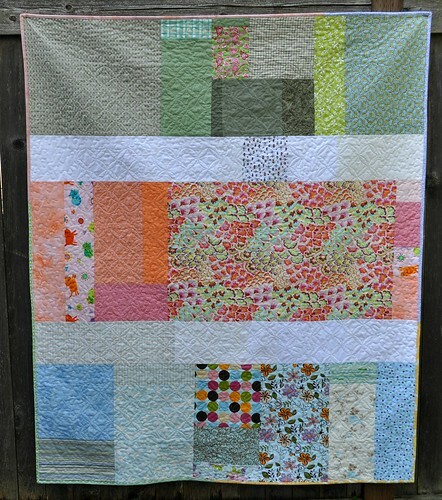 Notwithstanding, your quilt is BEAUTIFUL! 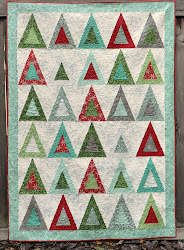 You did an amazing job with the quilting and I love the colors in your blocks! Congrats on a great quilt! The front is great, but the back is maybe even better. 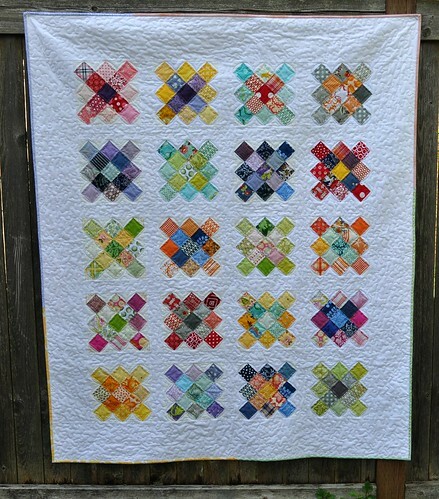 I just love seeing a great quilt, turning it over, expecting nothing and being surprised.